I'm still alive... I promise! Grad school started six weeks ago and I have been swamped with teaching-school work and grad homework ever since. One month down, ten to go and then I will have my Master's degree... I can't wait!!! In the meantime, here is a quick update on our exterior. 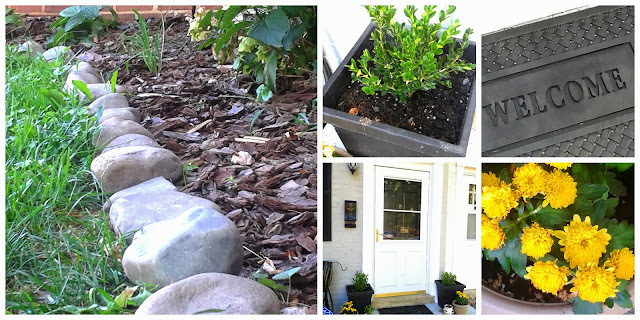 You can read about all of our painting and landscaping projects here and how we found a ton of free river rocks here. Can you believe I was just one rock short?! I bought two small boxwoods to frame the doorway. I really hope I can keep them alive! I think having some greenery around the door, especially in the winter, will be wonderful. I also got some small yellow mums on sale. I enjoyed the cheery yellow buds for the short amount of time they lasted. I also got a new welcome mat. It doesn't track in nasty brown fibers and has enough holes in it to air out pretty quickly. I think the basket weave design added a homey touch. Now I just need some free time to paint my door! God lucky in school hon! Your yard is looking wonderful, enjoy the season while it lasts! It looks great! And best wishes to you during this exciting and totally hectic time in your life. PTL you don't have to worry about babies in the mix yet :) ENJOY being young and pursuing your interests/dreams. When the time is right, you'll move into the next stage of life and love it just as much! I will say though....we'll miss seeing you. What an entrance! Your home looks so inviting. It is beautiful. Hi Lindsey! Your house front is looking wonderful! The boxwoods will grow with very little attention just add water! Before you know it you will have to be pruning them but they can take a lot of what nature dishes out so it was a great investment! Color in flowers is always cheering and the yellow does make you feel happy when you see it:D And the front mat is a great looking choice! Well done all around, Lindsey! I would imagine that all the progress you have made throughout the summer on your home improvements must make it easier to study and focus on your school work. Keep up the great work! Looking sweet!!! Love the colors! Good luck with school!